Are you an aggressive driver? If there’s any chance that you could end up flipped on your lid, an aftermarket roll cage is a smart investment. Stock cages are required to meet certain industry standards for strength and durability, but can still be destroyed in a nasty spill. Aftermarket cages will give your machine a custom look, but more importantly will provide extra safety for those who ride hard. Browse some good options here. A high-performance exhaust will increase horsepower and give your machine a more customized look. Aftermarket exhausts typically weigh less than factory systems and can increase overall performance while they lighten the load. Check out what might work for your situation at Muzzy’s and Sparks Racing. Night riders must think about adding aftermarket lights because obstacles and turns can appear seemingly out of nowhere once the sun is down. You need the best illumination available for riding safely in the dark, whether it’s over twisty trails or in the dunes. What’s best? High-output LED lights will show you the way and take the guesswork out of what lies ahead. Rigid Industries offers some great choices that are reasonably priced. UHMW (Ultra High Molecular Weight) plastic skid plates add protection and are a lightweight solution to protecting the underside of your UTV. Made of durable plastic, they’ll absorb shocks and retain their shape even when you’re driving over obstacles and debris along the trail. There are a variety of UHMW protection products to browse through here. Aftermarket shocks can ding your budget, but there are certainly good benefits to an upgrade to your vehicle’s stock suspension. You’ll experience more adjustment, greater durability and better performance over the stock shocks that come factory standard on the machine. Consider an upgrade if you’re looking for improved handling. Several companies such as JRI and Fox offer solutions and keep the pricing competitive. Stock tires and wheels are normally a good middle ground in price point, but depending on where you ride an upgrade to something designed for specific terrain can make a big difference. 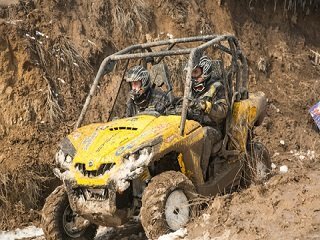 For dune riders, a lightweight spun aluminum wheel and paddle tire combination is recommended. Riding mostly over rocky trails? A beadlock wheel and minimum of a 6-ply tire will be a good choice. A DOT-approved version like GPS Offroad Products‘ eight-ply tire mounted on a Method Race Wheels beadlock wheel is also a great performance combination.